i hope you all had a wonderful christmas. mine was fairly good. i’m currently putting together a haul, but i doubt it will be up until the new year because i have another family celebration to attend. anyway, i saw book recaps on dragon waffles and paper fury and decided to make one myself. after all, i can only go so long without gushing/ranting about what i’ve read. shout-out to my friend izzy for making me read paranormal/horror books. 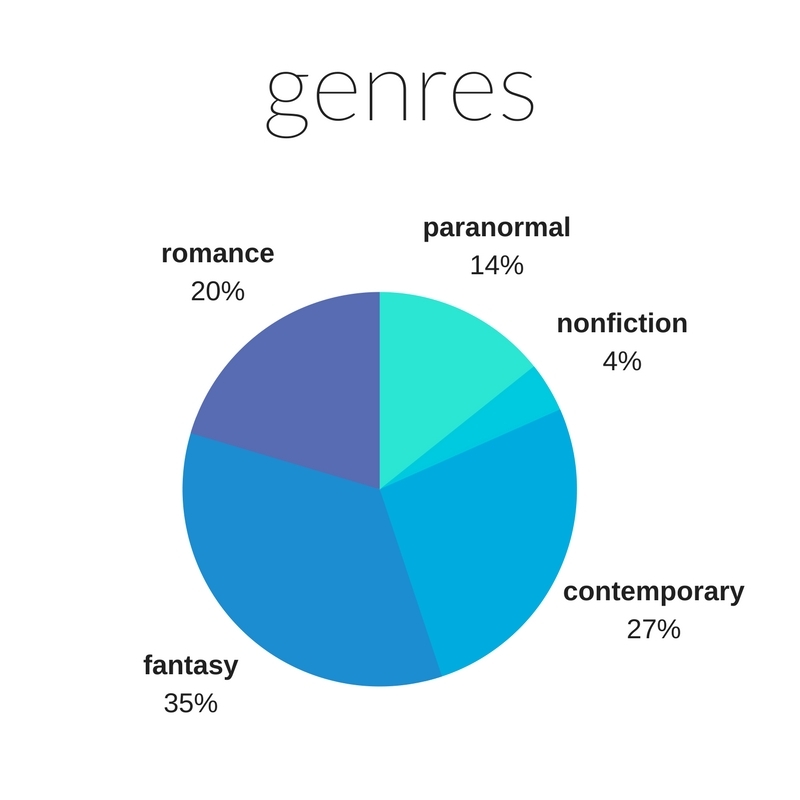 so apparently 20% of the books i read this year were romance? that’s a bit concerning because i generally hate that genre. but it’s rare to find a contemporary that isn’t also a romance, so that probably explains it. i had more books with lgbt+ characters on my tbr, but my mom wouldn’t let me read them. because, you know, i might become more open-minded and accepting and we can’t have that. 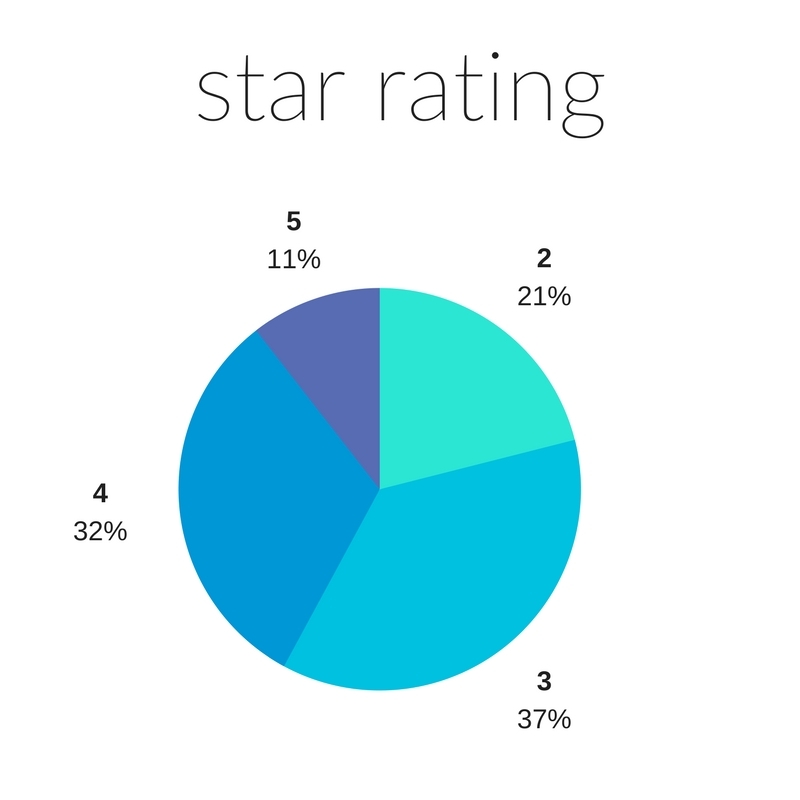 i’m very picky when it comes to giving five stars. also, i don’t think i’ve ever given a book just one star in my life. how to say goodbye in robot – i started sobbing when i finished this one. (this might be because i am extremely emotional and not because the book was sad, although it was.) i really wanted everything to turn out well for ghost boy and robot girl, and it ended much differently than i expected. tiger lily – peter pan retelling from tiger lily’s pov!! i’ve always loved peter pan and this book gave neverland new depth. it’s a romance, but not a fluffy one — it’s gritty and real and they hurt each other. all the bright places – i know this one is controversial, but i actually loved it a lot. i read it when i was “asleep,” as finch would say, and it stuck with me because it was like i was reading about myself. the empty grave – thanks for ripping out my heart, stroud. i hate you for putting my sweet children through that. lucky few – homeschoolers with death wishes!! sounds like my autobiography. heap house – originally, i thought it was just really, really weird, but it’s been growing on me since then. i might get hate for this, but i detest most of these and have no idea why they’re so popular. how can i call myself a bookworm if i haven’t read any of maggie stiefvater’s books?? have you read any of the books i mentioned? do you agree/disagree with me on my picks for the overhyped section? let me know in the comments. I hate romance too mostly because I don’t get it and it frustrates me endlessly. I think TFIOS is overhyped too. I have no idea why it’s so popular seriously. I mean it’s ok for people to like it (I have no problem in others having polar oposite opinions of me) buuut…can I just get a bullet list of all the reasons this is considered amazing? I’m legit curious about this. Yesss please read Maggie Stefvater!! It’s amazing and beautiful and I probably just overhyped it for you a bit more umm. if i were a sidekick character in a romance novel, i would fix everything in the mc’s angsty relationship, because even though i’ve never dated anyone, i would totally be able to address what they were doing wrong. i know tons of people like tfios, and it’s not a super terrible book, but yeah, idk what’s so great about it. it’s just another ya romance. i’m gonna see if my library has her books and then i’ll get them as soon as i can. She needs to finish the next book right now so I can read it! has she announced what the next book is going to be called? Nightfall’s cover is beautiful, though. It’s my favorite in the series so far. ahhh that’s too long to wait. i agree! her books always have gorgeous covers. They do! The artist is so good. that’s cool, have you posted any pictures of your tattoo? because i’d love to see it. I just got The Girl Who Drank the Moon yesterday as a late Xmas Present! How is it so far? cool! i’m a bit more than halfway through, it’s really good. the worldbuilding is incredible. Loren! *cries* how could you detest Wonder? *sobs* Oh well, great reading wrap up anyway! I really want to read Tiger Lily, it sounds great. i didn’t really hate a lot, it just didn’t stand out to me too much. thanks, you should read it, it’s pretty amazing. why would someone choose to read nonfiction? i only read two this year and they were poetry and a biography. some of them were good books, but not good enough to get all the praise that they do. in my opinion, anyway. are there any genres or topics that you like/dislike? i can give you some recommendations if it’s narrowed down a bit. i don’t read much historical fiction, so i can’t really help you there, but i’ve heard that salt to the sea by ruta sepetys is good. and castaways of the flying dutchman by brian jacques (mystery + pirates) is sort of historical fiction, i think. as for ya, heap house and the 39 clues series are good and without a lot of language. Ooh, thank you so much! I’ll be sure to check ’em out. They sound awesome! I do disagree a bit with your overhyped section. Personally, I absolutely LOVE Wonder. It’s been a favorite of mine since it came out. Also TFIOS was a bit hyped in like 2014 but it is very good. Not my favorite John Green book (that would probably be Looking for Alaska), but it was very good. And I have read any of the others yet, but I’m planning on reading I’ll Give You The Sun and Fangirl. i liked wonder, too, but to me, it wasn’t good enough to get all the praise that it does. i totally respect your opinion, though. i haven’t read looking for alaska and i’m a bit hesitant to pick up anymore of john green’s books, but i’ll check it out if you think it’s good. Looking for Alaska spoke to me very personally due to something I went through this past year, and that book helped me with a lot of stuff. And I really do like all John’s other books too. But I think Looking for Alaska definitely did the most for me. ok, cool, i’ll look for it at the library the next time i’m there. Hmm I agree with you about TFIOS and Wonder. I read the three story collection thing for Wonder and it just ruined it. What do you think of The Girl Who Drank The Moon? I read it recently but its kind of strange. I think there was a part about burping volcanoes, but I dont remember. i haven’t read the three story collection and now i don’t think i will. still haven’t finished it yet, but i’m almost done. you’re right, it is pretty strange. i like it so far, but i doubt it will be one of my favorite books. You need to read Queens Of Geek!!! I think what most people liked about TFIOS was the part about the cancer and the fact that there’s a death in it, which made it different from most YA novels. I really liked it, but yeah, it wasn’t anything I didn’t expect. What is We Are Okay about? i know, i’ve been looking for it since you recommended it to me. i just haven’t found it yet. hmm, that makes sense. i think it didn’t stand out to me because i read lots of mental illness contemporaries, which usually have themes of death. alright so basically the mc, marin, runs away before the book starts and not even the readers are told why until the end. her old best friend comes to visit her and it’s about them reconnecting and unburying marin’s past. the writing style is kind of rambly and journal-y, which i really liked. idk, i’m bad at explaining books. i agree, it’s a shame that more people don’t know about it. thank you! I also haven’t read anything by Stiefvater (that’s a very hard name to spell!) but I will in the new year because Paper Fury gushes over her so much and I already have a slight obsession with Paper Fury because everything she does and says is amazing and hilarious 😂 love your recap and hope you read lots of amazing books in 2018 ! haha, isn’t it? same, so many book bloggers have praised her books so i thought it’d give them a try. thanks, you too! I just finished Tiger Lily like 12 hours ago and oh my I loved it!!! I better rewatch the Peter Pan movie now…. isn’t it amazing? i love the peter pan movie but i haven’t seen it in years.